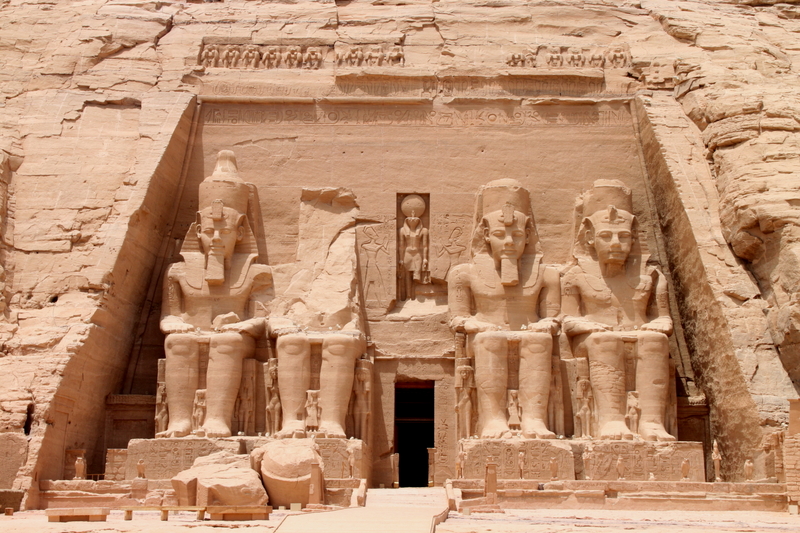 Abu Simbel is a temple built by Ramses II. 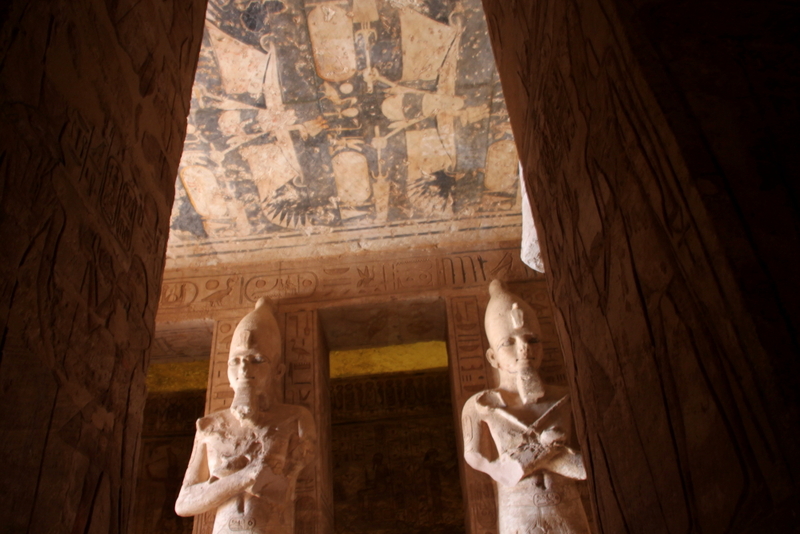 Although it is cut into a cliff like the Valley of the Kings, the internal layout is very similar to other temples – outer “courtyard”, then inner courtyard, and a sanctuary at the end. The temple was forgotten by the outside world and mostly buried in sand until the early 1800’s. When the High Aswan Dam was built the temple site was going to be flooded by Lake Nasser, and a major international effort helped move it a few hundred feet higher. 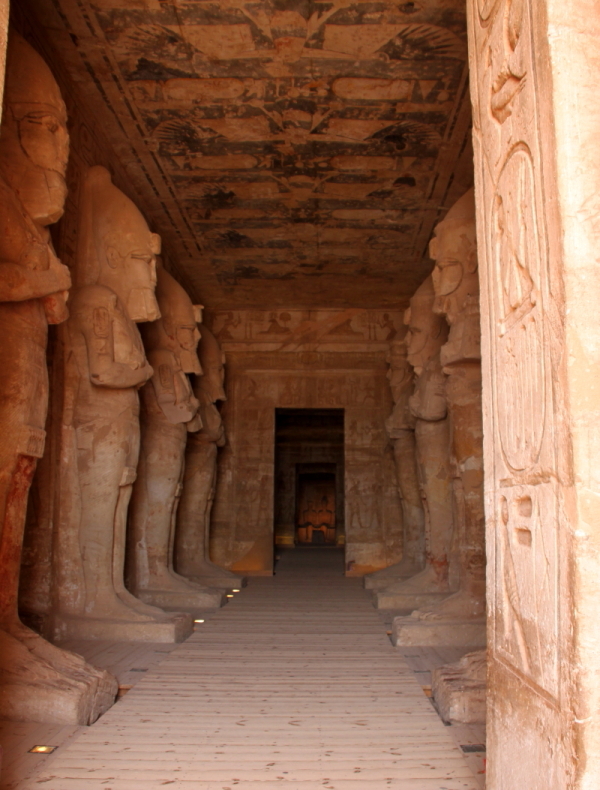 The entire temple complex, including the companion temple for Ramses’ wife, was dug out of the mountain and rebuilt in an artificial hill. 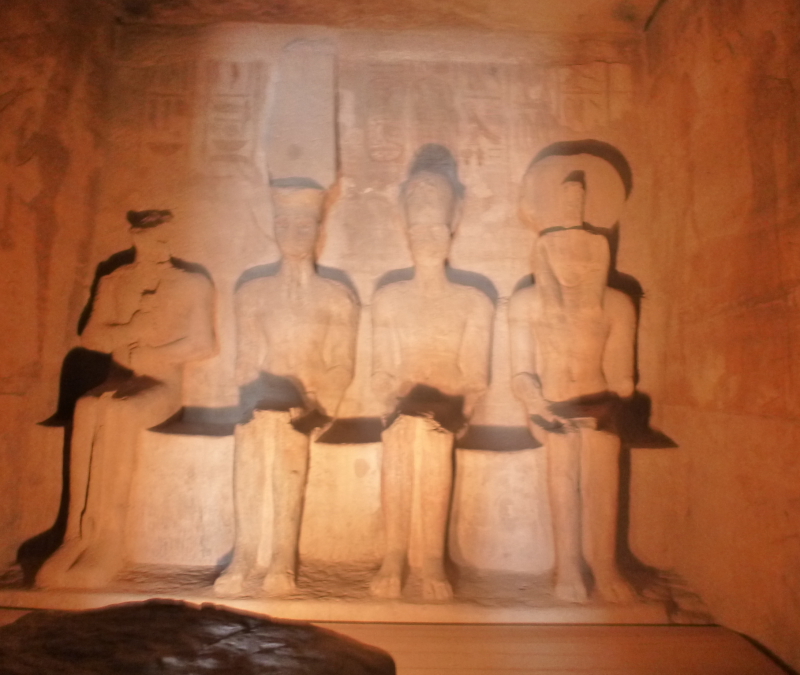 We flew to Abu Simbel on April 17, 2012. We departed Cairo quite early in the morning, and had an hour layover in Aswan. Here we met our local handler, who took our luggage to the hotel. Aswan was already close to 40C (over 100F). The airport in Aswan doubles as a military base, with individual bunkers for the aircraft. Our flight to Abu Simbel was a full plane, mostly other tourists. At the airport, we met up with Mohammed, who would be our guide for the next week or more until we left Luxor. The view for from the doorway into the temple interior. In the far distance the sanctuary is visible. Here’s a close-up of the sanctuary or shrine at the back of the temple. 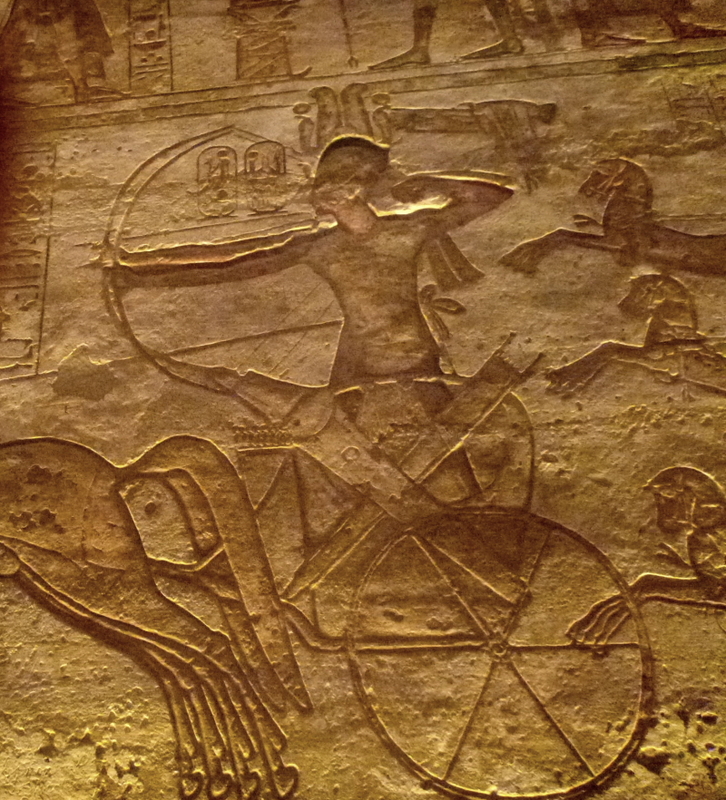 Ramses hunting with three arms. Current theory is that the relief was corrected with plaster, but the cover-up on the first arm fell off. Just inside the entrance gate is the pillared hall. 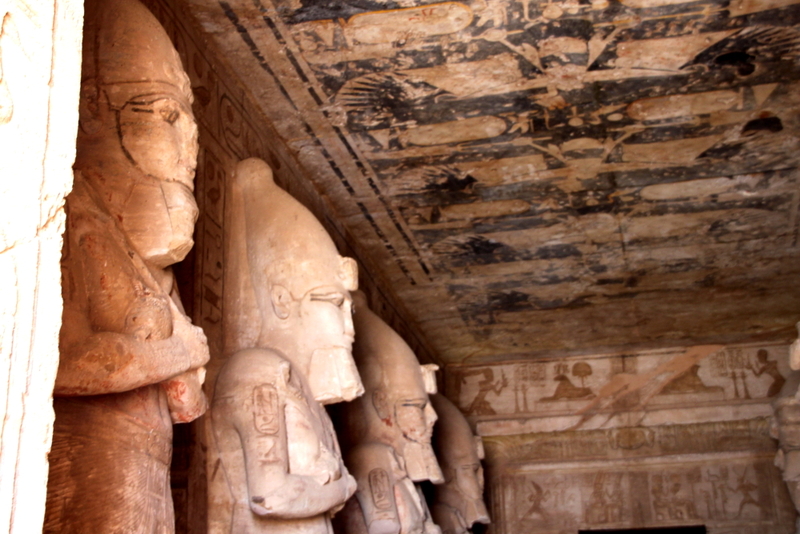 Just in case there are not enough statues of Ramses, the pillars here are also statues of Ramses. Note the buzzards on the ceiling, which is standard ceiling decor for these temples.